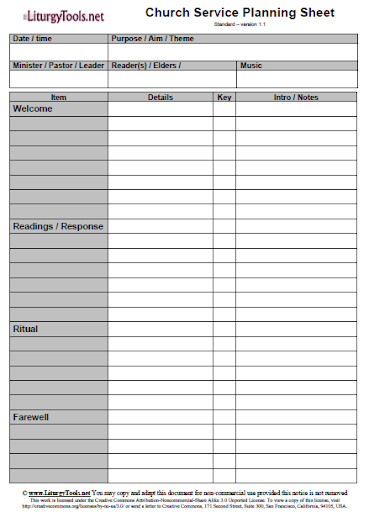 This is a template or worksheet for the form-of-service for a general purpose non-denominational or multi-denominational church service. It has sections for each of the typical elements in a form-of-service. (for music) What key it is to be played in. The form is one page long - so you can see all the elements in the service at a glance, but has enough space to list every individual element in most cases. Download the form by clicking on the format (MS Word or PDF) you want, and saving the file that opens onto your computer. The form is covered by a Creative Commons licence that lets you change it and make as many copies as you want for non-commercial purposes. The only restriction is that you must not remove the copyright notice.